Can passion be taught? Can it be fostered? The answer is yes. But perhaps more accurately, a team leader must create the right conditions for passion to emerge. Those conditions must be nurtured, not unlike a gardener creating the right conditions for his plants to flourish. Today’s workforce requires managers to be more than just a person in charge. 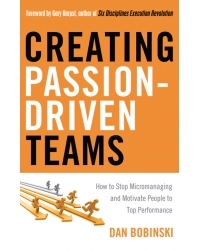 Creating Passion-Driven Teams show you how to tap your team’s natural motivations and achieve consistent, sustained top performance. Dan Bobinski is the president and CEO of Leadership Development, Inc., and director at the Center for Workplace Excellence. For more than 20 years Dan has coached and trained managers and leaders in the Fortune 500 as well as small and mid-sized businesses. His Workplace-Excellence blog has been listed among the top 100 daily must-reads for entrepreneurs, and his newspaper column on workplace issues is syndicated internationally. Dan is a passionate speaker and trainer on management topics, and he holds a master’s degree in human resource training and development as well as a BS in workforce education and development. Dan lives in Boise, Idaho.